To introduce this section, we would like to quote from the National Curriculum Framework: 2005. ‘Learning for the sake of being examined in a mechanical manner takes away the joy of being young, and delinks knowledge from everyday experience’. For the curriculum to serve its noble purpose, it must become a facilitator of curiosity and enthusiasm. After capturing a child’s attention it must accelerate knowledge gaining. It should provide the child with questions to ask, with pursuits to follow and act as an interface between individual experience and theoretical assimilation. By doing so, such a curriculum will then breathe new life into the educational process. Children will then understand the importance of arranging and rearranging concepts so as to gain a stronger grasp on studied matter…and reject information that was memorised without any conceivable use in mind. Let us now offer you a detailed insight of the curriculum. The early childhood curriculum at Universal is designed to satisfy the needs, interests and abilities of the young child as well as the demands of the 21st century. Our curriculum draws inspiration from the theory of constructivism, the Reggio Approach Learning and the theory of multiple intelligences. Play is at the centre of our early childhood curriculum as research has shown time and again the benefits of play for young children. Play not only clarifies concepts, facilitates social development and provides emotional relief but also provides sheer joy to the young learner! Our curriculum lays emphasis on developing all the aspects of the child; cognitive, physical, social and emotional. Our approach resonates with the theory of Multiple Intelligences that focuses on the development of the whole child. Linguistic: The learning programme provides a language rich environment which includes a sensitivity to the freedom of speech and opportunities to develop listening, communication skills and vocabulary with a strong emphasis on pre-literacy skills through phonics. Logical-Mathematical: The learning programme facilitates the ability to problem solve and construct solutions. The focus is on developing logic, order, patterns and relationships, abstract symbols, concepts of time, space, quantity, number, causes and effect. Visual Spatial: Activities in this area emphasize the ability to perceive the visual spatial world accurately by engaging the child in creative activities such as drawing, colouring, painting, origami and other craft work through memory and observation. Bodily Kinesthetic: Activities in this area maximize the flow and movement of each child through diverse experiences which help in developing their gross and fine motor skills, such as sand, water play, dance and drama as well as physical exercise. Musical: Activities focus on cultivating an appreciation for music through exposure to songs and rhymes. Interpersonal: A typical day at school provides freedom to develop positive friendships, relationships and self-confidence through self-initiative, freedom of choice and group work with both peers and adults. Intrapersonal: This area is developed through activities such as prayer and reflection leading to self-knowledge and the ability to act adaptively on the basis of that knowledge. Naturalistic: This area develops the ability to understand and learn about one’s natural and man-made environment by exploring the world both inside and outside the classroom. Our curriculum is socially and culturally appropriate. We respect diversity and impress upon the young child an awareness and appreciation of cultures other than one’s own through the celebration of festivals. The Project Approach as developed by Lillian Katz and Sylvia Chard is one of the unique aspects of education at our institute. Through this approach the child and the teacher become co-investigators as they embark upon the study of a topic of significance. Field trips, interviewing resource persons, reading books, watching audio-visual content and most importantly documentation of the learning process, form parts of the process leading to the culmination of the topic. 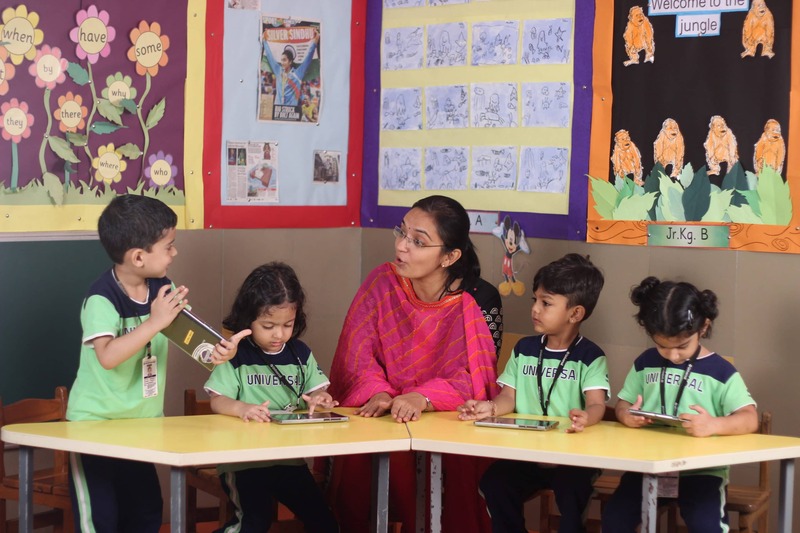 In this approach, our objective is that young children learn critical thinking and problem solving, important aspects of ‘the learning to learn’ phenomenon. The child at Universal also learns about the other 3 R’s – responsibility, respect and the importance of relationships, through the life skills programme specially integrated into the curriculum. At Universal, we do not necessarily view assessments as the sole measure of a child’s potential. In a rapidly evolving educational environment, methods and techniques need to match the need of the hour. To achieve our greater goals, we prefer an approach that considers both sides of the coin. At this tender age careful attention is paid to a child’s likes and dislikes. Our assessment includes a formal written document that traces minute details across all the areas of development. This is shared with you twice a year. In order to arrive at this assessment, the teacher makes detailed observation on a regular and periodic basis. This kind of assessment recognizes the uniqueness of each learner and allows for differences in styles and rates of learning. This assessment utilizes an array of tools and a variety of processes including, collections of representative work [artwork, stories], records of systematic observation by teachers, records of conversation and interviews with children. 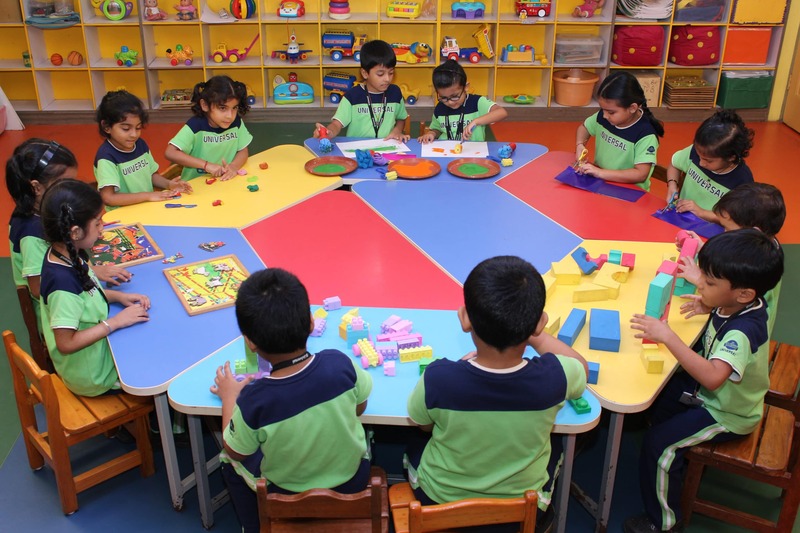 The Pre-School Infrastructure is divided into different zones to provide experiential learning. The Dramatic Play area welcomes every child to interact with puppets, props and disguises that help to develop your child’s self-image as he adopts varied roles. The Experiment and Discover area is an amazing space that appeals to the child’s growing curiosity. Here the child learns basic scientific concepts through first-hand experience. The Puzzles and Blocks area is every child’s dream space! 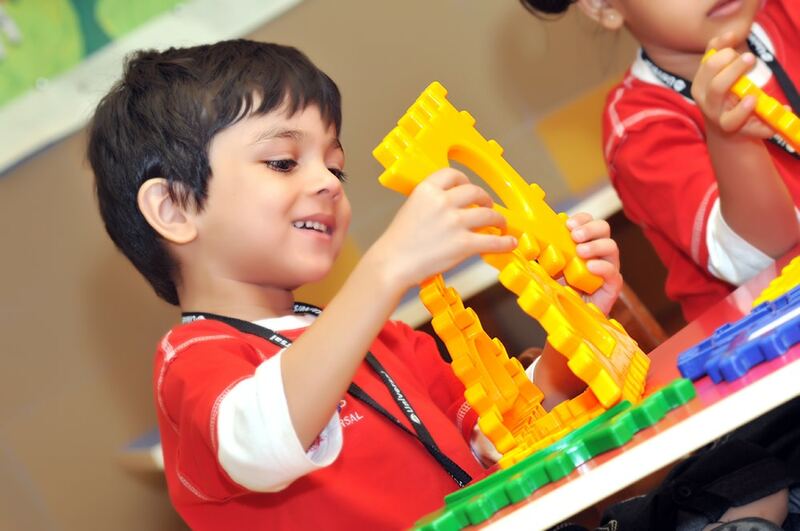 From jig-saws to construction kits, it brings out the engineer in every little one! The Reading and Writing area develops your child’s ability to recognize the alphabet, words and sentences through sight reading as well as phonic training. The attractive displays and comfortable seating also gently invite your child to explore writing.